Xanthine oxidase (XO) serves as an important biological source of oxygen-derived free radicals that contribute to the oxidative damage of living tissues. XO is involved in the medical condition known as gout, which is characterized by hyperuricemia that leads to uric acid deposition in the joints resulting in painful inflammation. Hyperuricemia, which is present in 5-30% of the general population, seems to be increasing worldwide and is considered an important risk factor in serious disorders, e.g. renal failure. ,, Uricosuric drugs which increase the urinary excretion of uric acid, or XO inhibitors which block the terminal step in uric acid biosynthesis, can lower the plasma uric acid concentration, and are generally employed for the treatment of gout. , Allopurinol is the only clinically used XO inhibitor in the treatment of gout. , However, this drug suffers from many side effects such as hepatitis, nephropathy, and allergic reactions. Thus, the search for novel XO inhibitors with a higher therapeutic activity and fewer side effects are desired not only to treat gout but also to combat various other diseases associated with the XO activity. In the current study, we have used an optimized protocol to screen the methanolic extracts of various medicinal plants, collected from several areas of Jordan, for their XO inhibitory activities. A total of 23 medicinal plants belonging to 12 families, regardless of their claimed ethnopharmacological and/or food uses, were tested using a simple, fast, efficient, and reliable spectrophotometeric method, in an attempt to find a new herbal-derived material with potential XO inhibitory activities. Plant materials, of the selected species (n = 23), were collected from different geographical places of Jordan, during the flowering periods of these plants. The collected plants were identified taxonomically by Dr. Khaled Tawaha (Faculty of Pharmacy, Jordan University), and voucher specimens were deposited at the Herbarium Museum of the Faculty of Pharmacy, Jordan University of Science and Technology. The plant materials were cleaned of residual soil, air-dried at room temperature, ground to a fine powder using a laboratory mill, and finally passed through a 24-mesh sieve to generate a homogeneous powder. The powder materials were stored in a dark place, at room temperature (22-23°C), until extraction. where test inclination is the linear change in the absorbance per minute of the test material, and blank inclination is the linear change in the absorbance per minute of the blank. In this study, the methanolic extracts of 23 different plants belonging to 12 different families were investigated as potential XO inhibitors. 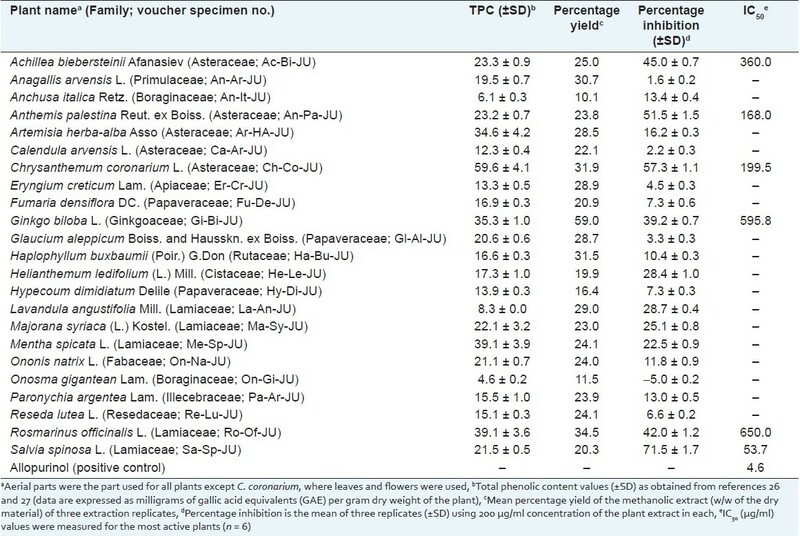 The selected plants and their XO inhibition assay results are summarized in [Table 1]. The degree of XO inhibition was evaluated for the extracts of all species at a concentration of 200 μg/ml. However, the IC 50 values were determined only for those plants (n = 6) which showed an inhibitory activity of 40% or more when compared to uninhibited enzymatic reaction. These latter plants are Salvia spinosa L. (Lamiaceae), Chrysanthemum coronarium L. (Asteraceae), Anthemis palestina Reut. ex Boiss. (Asteraceae), Achillea biebersteinii Afansiev (Asteraceae), Rosmarinus officinalis L. (Lamiaceace), and Ginkgo biloba L. (Ginkgoaceae). The inhibitory profiles of three selected examples of these plants are shown in [Figure 1]. Interestingly, the most potent extract was prepared from S. spinosa, a plant with no previous reports of XO inhibitory activity. The genus is well known as a rich source of polyphenols and some of the common species, e.g., S. officinals, were previously reported to possess XO inhibitory effects. ,,, A few research has been previously published about the chemical constituents and/or the biological activities of S. spinosa. In two studies from Jordan, a good correlation was found to exist between the antioxidant activity and the total phenolic contents of both methanolic and aqueous extracts prepared from a wild growing S. spinosa. , Phytochemically, hydrodistilled volatile oil of the aerial part was the most studied fraction of the plant; thymol was found as the principal component in a Jordanian species, whereas (E)-β-ocimene, β-caryophyllene, and isopentyl isovalerate were the major compounds of an Iranian species., Moreover, our results showed an agreement with previously reported XO inhibitory activities for extracts obtained from various plants of Lamiaceae family like Majorana syriaca (L.) Kostel, Mentha spicata L., and Rosmarinus officinalis L., whose activities were attributed to the presence of some phenolics, particularly flavonoids. , The reported antioxidant activities of these plants were found to be, at least in part, due to its inhibitory activity on XO. Of the other tested species, C. coronarium also showed a significant XO inhibitory activity with an IC 50 value of 199.5 μg/ml. Although such activity was reported for some other species of Chrysanthemum like C. sinense, , this is the first report on C. coronarium. The same scenario was also noticed for Artemisia herba-alba Asso, where the XO inhibitory activity was previously reported for the species A. vulgaris,  A. minor,  A. scoparia,  A. princeps,  and A. asiatica. It's noteworthy that much of the XO inhibitory activity of the latter plants was reported to be attributed to their phenolic, mainly flavonoid, constituents, which generally play an important role in decreasing lipid peroxidation and oxidative stress of diseased animals. Furthermore, in two previous studies conducted in Jordan, the methanolic and aqueous extracts of most of the plants of the present study were shown to possess significant antioxidant effects, which were correlated, as reported, to their phenolic contents (phenolic content data are shown in [Table 1]). , Undoubtedly, the XO inhibition, reported in the present study, would be an additional mechanism that can explain their antioxidant activities. In conclusion, the obtained results suggest that the studied plants can form a good source of effective crude inhibitors for XO which can be used in the treatment of gout and other XO-related disorders. However, further biological investigations are needed, particularly using animal models, to verify the reported inhibitory activities under in vivo conditions. In future works, these active plants will be further investigated in order to isolate, identify, and evaluate the potentially phytoactive compounds responsible for the XO inhibitory activities reported in the present study. The authors wish to thank the Deanship of Academic Research (DAR) at the University of Jordan for their financial support. 1. Martinez-Cayuela M. Oxygen free radicals and human disease. Biochimie 1995;77:147-61. 2. Dormandy TL. An approach to free radicals. Lancet 1983;2:1010-4. 3. Cheng HY, Lin TC, Yu KH, Yang CM, Lin CC. Antioxidant and free radical scavenging activities of Terminalia chebula. Biol Pharm Bull 2003;26:1331-5. 4. Cos P, Ying L, Calomme M, Hu JP, Cimanga K, Van PB, et al. Structure-activity relationship and classification of flavonoids as inhibitors of xanthine oxidase and superoxide scavengers. J Nat Prod 1998;61:71-6. 5. Valko M, Leibfritz D, Moncol J, Cronin MT, Mazur M, Telser J. Free radicals and antioxidants in normal physiological functions and human disease. Int J Biochem Cell Biol 2007;39:44-84. 6. Forbes JM, Coughlan MT, Cooper ME. Oxidative stress as a major culprit in kidney disease in diabetes. Diabetes 2008;57:1446-54. 7. Watanabe S, Kanellis J, Nakagawa T, Han L, Ohashi R, Lan H, et al. Reducing uric acid as a means to prevent cardiovascular and renal disease. Expert Opin Ther Pat 2002;12:193-9. 8. Vazquez-Mellado J, Alvarez-Hernandez E, Burgos-Vargas R. Primary prevention in rheumatology: The importance of hyperuricemia. Best Pract Res Clin Rheumatol 2004;18:111-24. 9. Terkeltaub R. Gout. Novel therapies for treatment of gout and hyperuricemia. Arthritis Res Ther 2009;11:236. 10. Schlesinger N, Dalbeth N, Perez-Ruiz F. Gout - what are the treatment options? Expert Opin Pharmacother 2009;10:1319-28. 11. Hoey BM, Butler J, Halliwell B. On the specificity of allopurinol and oxypurinol as inhibitors of xanthine oxidase. A pulse radiolysis determination of rate constants for reaction of allopurinol and oxypurinol with hydroxyl radicals. Free Radic Res Commun 1988;4:259-63. 12. Nakamura M. Allopurinol-insensitive oxygen radical formation by milk xanthine oxidase systems. J Biochem 1991;110:450-6. 13. Fagugli RM, Gentile G, Ferrara G, Brugnano R. Acute renal and hepatic failure associated with allopurinol treatment. Clin Nephrol 2008;70:523-6. 14. Gullo VP, McAlpine J, Lam KS, Baker D, Petersen F. Drug discovery from natural products. J Ind Microbiol Biotechnol 2006;33:523-31. 15. Newman DJ, Cragg GM. Natural products as sources of new drugs over the last 25 years. J Nat Prod 2007;70:461-77. 16. Bustanji Y, Hudaib M, Tawaha K, Mohammad M, Almasri I, Hamed S, et al. In vitro xanthine oxidase inhibition by selected Jordanian medicinal plants. Jordan J Pharm Sci 2010. [In press]. 17. Mohammad MK, Almasri IM, Tawaha K, Al-Nadaf A, Hudaib M, Al-Khatib HS, et al. Antioxidant, antihyperuricemic and xanthine oxidase inhibitory activities of Hyoscyamus reticulatus. Pharm Biol 2010;48:1376-83. 18. Alali FQ, El-Elimat T, Li C, Qandil A, Alkofahi A, Tawaha K, et al. New colchicinoids from a native Jordanian meadow saffron, Colchicum brachyphyllum: Isolation of the first naturally-occurring dextrorotatory colchicinoid. J Nat Prod 2005;68:173-8. 19. Oran S, Al-Eisawi D. Check list of medicinal plants in Jordan. Dirasat Med Biol Sci 1998;25:84-111. 20. Cai Y, Luo Q, Sun M, Corke H. Antioxidant activity and phenolic compounds of 112 traditional Chinese medicinal plants associated with anticancer. Life Sci 2004;74:2157-84. 21. Sweeney AP, Wyllie SG, Shalliker RA, Markham JL. Xanthine oxidase inhibitory activity of selected Australian native plants. J Ethnopharmacol 2001;75:273-7. 22. Chiang HC, Lo YJ, Lu FJ. Xanthine oxidase inhibitors from the leaves of Alsophila spinulosa (Hook) Tryon. J Enzyme Inhib 1994;8:61-71. 23. Kong LD, Abliz Z, Zhou CX, Li LJ, Cheng CH, Tan RX. Glycosides and xanthine oxidase inhibitors from Conyza bonariensis. Phytochemistry 2001;58:645-51. 24. Cho YJ, Ju IS, Yun Dh, Chun SS, An BJ, Kim JH, et al. Biological activity of extracts from garden sage (Salvia officinalis L.). J Appl Biochem 2008;51:296-301. 25. Kahkonen MP, Hopia AI, Vuorela HJ, Rauha JP, Pihlaja K, Kujala TS, et al. Antioxidant activity of plant extracts containing phenolic compounds. J Agric Food Chem 1999;47:3954-62. 26. Alali FQ, Tawaha K, El-Elimat T, Syouf M, El-Fayad M, Abulaila K, et al. Antioxidant activity and total phenolic content of aqueous and methanolic extracts of Jordanian plants: An ICBG project. Nat Prod Res 2007;21:1121-31. 27. Tawaha K, Alali FQ, Gharaibeh M, Mohammad M, El-Elimat T. Antioxidant activity and total phenolic content of selected Jordanian plant species. Food Chem 2007;104:1372-8. 28. Flamini G, Cioni PL, Morelli I, Bader A. Essential oils of the aerial parts of three Salvia species from Jordan: Salvia lanigera, S. spinosa and S. syriaca. Food Chem 2006;100:732-5. 29. Nik ZB, Mirza M. Volatile constituents of Salvia spinosa L. from Iran. Flavour Fragr J 2005;20:311-2. 30. Grevsen K, Frette XC, Christensen LP. Content and composition of volatile terpenes, flavonoids and phenolic acids in Greek oregano (Origanum vulgare L. ssp. hirtum) at different development stages during cultivation in cool temperate climate. Eur J Hortic Sci 2009;74:193-203. 31. Venskutonis PR, Gruzdiene D, Tirzite D, Tirzitis G. Assessment of antioxidant activity of plant extracts by different methods. Acta Hortic 2005;677:99-107. 32. Baek BR, Kim MK, Lee SE, Hwang YH, Lee HS. Isolation of xanthine oxidase inhibitors from Ginkgo biloba leaves-derived components. J Food Sci Nutr 2002;7:18-21. 33. Nguyen MT, Awale S, Tezuka Y, Tran QL, Watanabe H, Kadota S. Xanthine oxidase inhibitory activity of Vietnamese medicinal plants. Biol Pharm Bull 2004;27:1414-21. 34. Nguyen MT, Awale S, Tezuka Y, Ueda JY, Tran QL, Kadota S. Xanthine oxidase inhibitors from the flowers of Chrysanthemum sinense. Planta Med 2006;72:46-51. 35. He ZZ, Yan JF, Song ZJ, Ye F, Liao X, Peng SL, et al. Chemical constituents from the aerial parts of Artemisia minor. J Nat Prod 2009;72:1198-201. 37. Park BH, Lee SI, Kim SD. Effect of herb distillate on hepatic xanthine oxidase activity and serum lipid profiles in carbon tetrachloride-administered rats. J Food Sci Nutr 2007;12:16-22. 38. Huh K, Kwon TH, Shin US, Kim WB, Ahn BO, Oh TY, et al. Inhibitory effects of DA-9601 on ethanol-induced gastrohemorrhagic lesions and gastric xanthine oxidase activity in rats. J Ethnopharmacol 2003;88:269-73. 39. Barbakadze V, Gogilashvili L, Amiranashvili L, Merlani M, Mulkijanyan K, Churadze M, et al. Poly[3-(3,4-dihydroxyphenyl)glyceric acid] from Anchusa italica roots. Nat Prod Commun 2010;5:1091-5. 40. Allayarov K, Khamidkhodzhaev SA, Korotkova EE. Alkaloids-containing plants of Turkmenian S.S.R. Izv Akad Nauk Ser Biol 1965;4:62-5. 41. Barrero AF, Herrador MM, Arteaga P, Rodriguez-Garcia I, Garcia-Moreno M. Resorcinol derivatives and flavonoids of ononis natrix subspecies ramosissima. J Nat Prod 1997;60:65-8. 42. Khallouki F, Younos C, Soulimani R, Bessiere JM. Chemical composition of the essential oil of Ononis natrix L. Fabaceae. J Essent Oil Res 2002;14:431-2. 43. San Feliciano A, Barrero AF, Medarde M, Miguel del Corral JM, Calle MV. An isocoumarin and other phenolic components of Ononis natrix. Phytochemistry 1983;22:2031-3. 44. Bader A, Flamini G, Cioni PL, Morelli I. 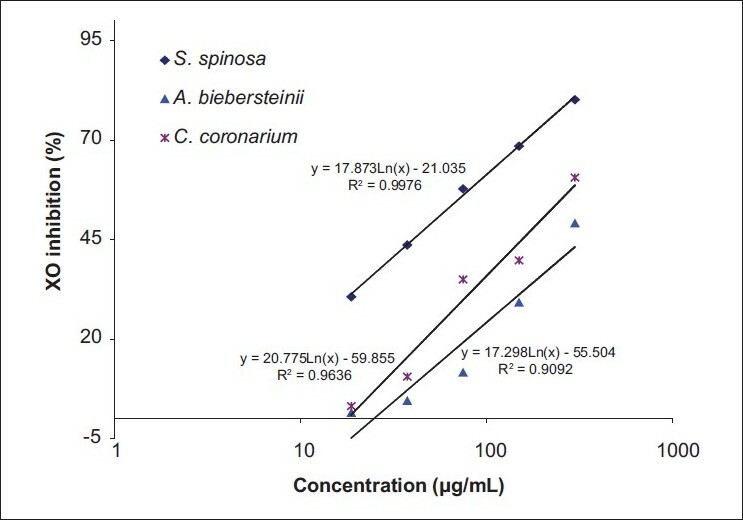 Essential oil composition of Achillea santolina L. and Achillea biebersteinii Afan. collected in Jordan. Flavour Fragr J 2003;18:36-8. 45. Al-Howiriny TA, Mossa JS, Ahmed B. Beibersteneolide a and b: Two new sesquiterpene lactones from Achillea beiberstenii. Indian J Chem B 2005;44:2538-44. 46. Oskay E, Yesilada A. Four flavonoids and three other constituents from Achillea biebersteinii. J Nat Prod 1984;47:742. 47. Greger H, Grenze M, Bohlmann F. Polyacetylenic compounds. Part 260. Amides from Achillea species and Leucocyclus formosus. Phytochemistry 1981;20:2579-81. 48. Tewari R, Sharma A. Chemistry of lavender oil: A review. Curr Res Med Arom Plants 1987;9:92-104. 49. Miliauskas G, Venskutonis PR, van Beek TA. Screening of radical scavenging activity of some medicinal and aromatic plant extracts. Food Chem 2003;85:231-7. 50. Makri O, Kintzios S. In vitro rosmarinic acid production: An update. In: Ramawat KG, editor. Biotechnology of medicinal plants: vitalizer and therapeutic. Enfield (USA): Science Publishers Inc.; 2004. p.19-31. 3 Phytochemical composition, protective and therapeutic effect on gastric ulcer and a-amylase inhibitory activity of Achillea biebersteinii Afan. 4 Chemical composition and antimicrobial, cytotoxicity, antioxidant and enzyme inhibitory activities of Salvia spinosa L.